Lehrbuch der haut- und geschlechtskrankheiten für studirende und ärzte. Lesser, Johann Edmund Anton, 1852-1918. Leipzig : F. C. W. Vogel, 1886. Description, 2nd edition : part 1: xi p., 328 p., [6 l.] pl. ; part 2: viii p., 318 p., [4 l.] pl. ; illus: phots., in-text engrs. ; 23 cm. Photographs : heliogravures on printed leafs. 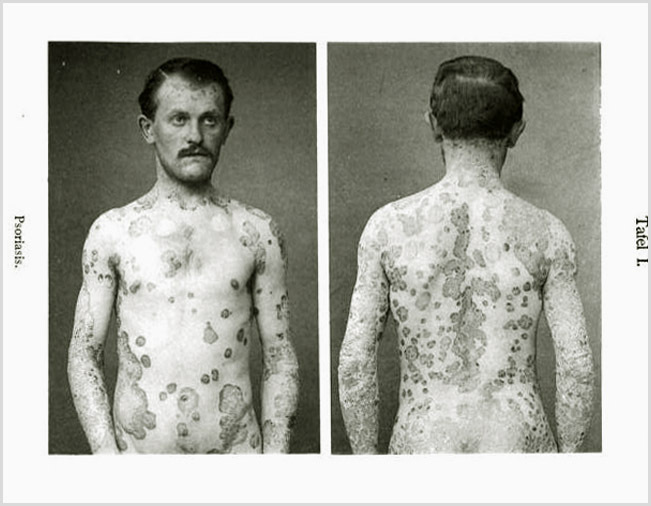 Subject: Skin — Diseases ; syphilis. Author caption: von Dr. Edmund Lesser ; Privatdocent an der Universität Leipzig. Habilitation, University of Leipzig, 1882. Associate professor, University of Bonn, 1892. Chief physician, syphilitic clinic, Berlin-Charité, 1896. First director, department of dermatology, University of Berlin, 1897. In two parts: Teil I. – Hautkrankheiten ; Teil II. – Geschlechtskrankheiten. Lesser contributed to von Strümpell’s Lehrbuch der speciellen Pathologie und Therapie der inneren Krankheiten (2nd edition, 1885). No photographs in the first edition (1885). Numerous editions, revised and enlarged. Italian edition: Manuale delle malattie cutanee e venereo sifilitiche. Milan: Francesco Vallardi. GM 4006 & 5206: Joseph Jadassohn (1863–1936) published the 14th edition (1927-1937). Index Medicus, 1887 edition: 11300751160, 20904671130, 22001691150. Durch das freundliche Entgegenkommen des Herrn Verlegers ist es mir möglich gewesen, dieser Auflage einige Lichtdrucktafeln, welche sämmtlich auf photographischem Wege hergestellt sind und daher jedenfalls den Vorzug der absoluten Naturtreue haben, hinzuzufügen und ohne den Werth derselben zu über- schätzen, glaube ich doch, dass sie den Lesern eine nicht unwillkommene Beigabe sein werden. Die bildliche Darstellung von Hautkrankheiten ist im allgemeinen in befriedigender Weise nur durch grosse colorirte Tafeln, nicht durch kleine einfarbige Abbildungen möglich und dem Bedürfniss nach derselben kann daher nur durch grosse und kostspielige Atlanten genügt werden. In einem Buche, wie dem vorliegenden, kann überhaupt nur eine beschränkte Anzahl ganz besonders prägnanter Krankheitsbilder gebracht werden und die Mehrzahl gerade der häufigsten und wichtigsten Hautkrankheiten eignet sich nicht für die hier allein mögliche Darstellungs- weise. Ich halte es andererseits aber für keinen Nachtheil, dass einige der Abbildungen seltenere Erkrankungen betreffen, denn gerade bei diesen wird gelegentlich die Erinnerung an das Bild für die Erkennung von Wichtigkeit sein.— Foreword to the second edition. Through the friendly courtesy of the esteemed publisher, it has become possible for me to supplement this volume with a few collotypes, which are reproduced entirely by photographic means and accordingly, in every instance, have the advantage of absolute natural fidelity and, without overestimating their value, I do believe that they will be a not unwelcome addition for the readers. Pictorial representation of skin diseases by a satisfactory method is generally possible only by large colored plates, not by small monochromatic images, and for this the necessity of large and costly atlases alone suffices. In a book like the one at hand, usually only a limited number of images of the most exceptional diseases can be used and here the only possible kind of representation is just not suitable for the majority of the most common and important skin diseases. Contrariwise, I hold that there is no disadvantage that some of the photographs concern rare diseases, precisely because for these [diseases] the memory of the image will conveniently become the recognition of importance.